Late last year we announced the upcoming opening of our second data center in Nuremberg – now it’s done. A total area of about 2.300 square meters, the in-house transformer station with a capacity of more than 2.4 megavolt amperes and the multiple redundant fiber connections of our new object are waiting for 10.000 new internet servers. This is the benchmark that we have set on our second data center location. Now 10.000 free server spaces are waiting to be filled up. In order to achieve this goal as fast as possible, we would like to offer our customers the best server at the best price – but still offering our high-quality customer support and services. 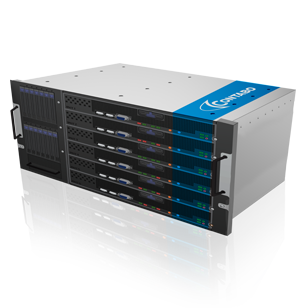 Now it’s up to you: Get the new Contabo Dedicated Server Dual Xeon! It is still a big secret but as you know women's biggest passion is gossip and that's the reason why I'm gonna share these very important news here. Do you know the saying „One man's joy is another man's sorrow“? This is the present situation within our range of server products. As we mentioned before our Giga Dedicated Server XL will vanish from our portfolio after 7 successfull years - his place instead will take our favorite „Dedicated Server Duo“. Our previous top model, the Dedicatet Server 6-Core, loses his top position aswell. Instead, a much more powerful server model takes its place. The new model will shine with even more power and energy, that's why we call it already the „gladiator“ among our root servers. So, be prepared for the offical announcement of the server and stay tuned.